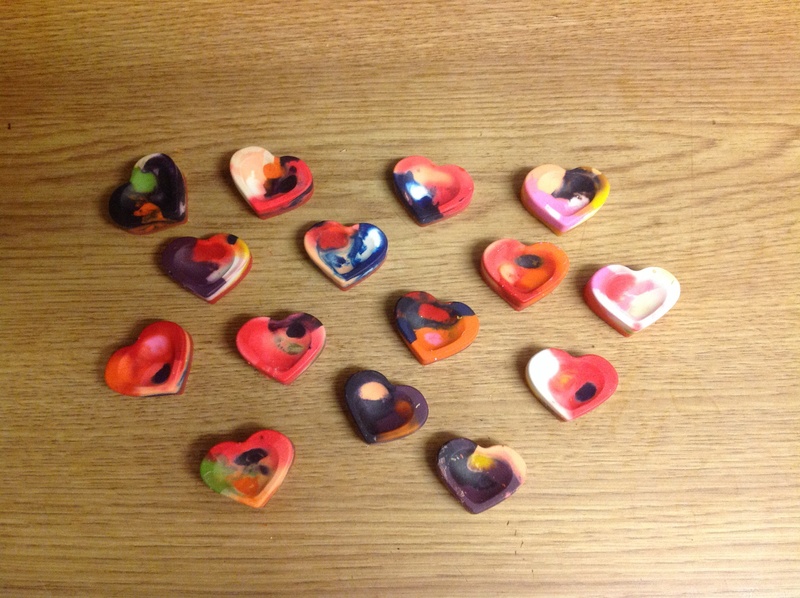 This was an idea from one of the mums at toddlers (Thank-you Lesley). 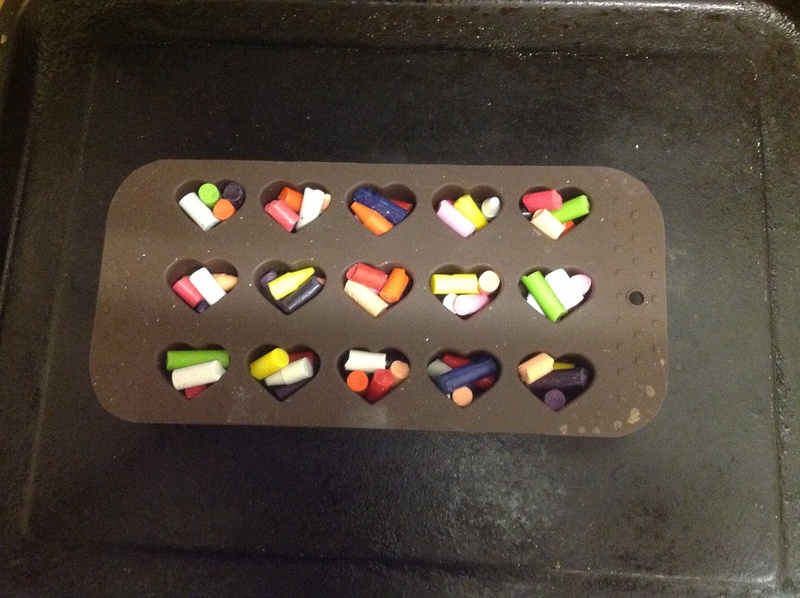 Collect any broken pieces of crayon and place in a silicon baking tray. Mine happened to be heart shaped, just in time for valentines day! Place in oven at medium heat for 15 minutes. Amazing results but leaves the house a bit smelly. After they were made I gave the kids one each and said that just like our lives can be “broken” by sin and hurt and selfishness, God makes us a new creation (2 Corinthians 5:17) and works all thing out for the good of those who love Him (Romans 8:28). We went for a walk at the local park and found some sticks. 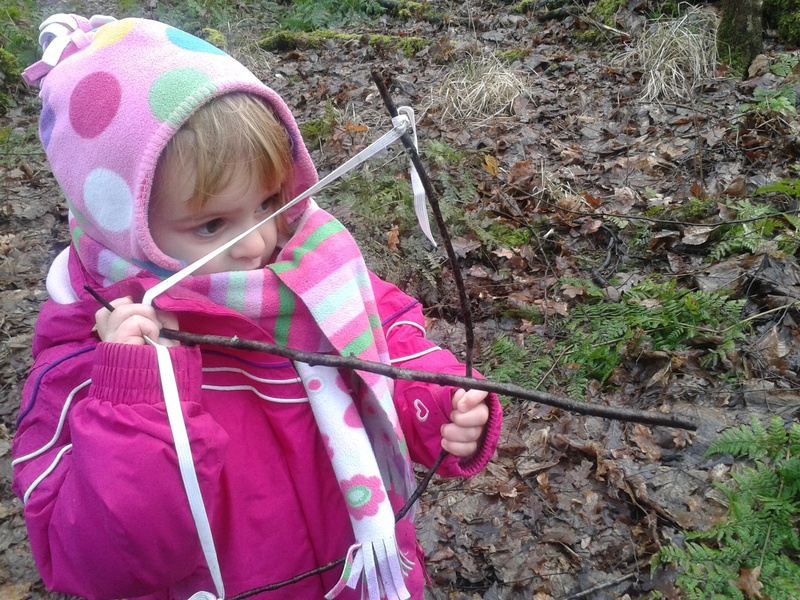 I had brought elastic from my very neglected sewing box and impressed the kids by making up some bows and arrows. At some point in the day I reminded them of the bible story of Noah and Gods plan to defeat sin, hurt and sadness once and for all by sending His son to become sin for us so that He would take the punishment we deserve. I asked the kids what they thought it meant that “Noah walked with God”. We chatted about how you can get all different types of walks. Sometimes we can walk for fun or adventure. Other times we walk the same route every day. And other times we can get lost on a walk or fall and hurt ourselves. In our walk with God He never gets tired or weary (Isaiah 40:28).He patiently guides and encourages us to follow Him. God is interested in every part of our lives and wants us to talk with Him and share our experiences with Him. 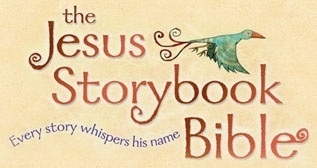 He is also our guide in times when we get lost or go our own way and helps us back on our feet when we fall. Whether things are good or bad for us, God wants to and promises He will walk with us. There are certain patterns emerging in my personality. Some of which I am happy with, some I would like to change and some are just down right embarrassing. Recently I spent about an hour negotiating in a mobile phone shop for a new contract. I was very excited at the prospect of getting a new phone. However, when it came to cancelling the contract with my previous provider I was informed I had another year to go on my contract and would have it pay a hefty penalty to leave. Any feelings of disappointment were masked significantly by total humiliation. Once again I had embarrassed myself. In the story of Noah, just like Adam and Eve, people had once again forgotten to walk with God. There is a pattern throughout history of Gods blessings, followed by mankinds desire to go our own way followed by consequences for sin and each time God provides a way out through forgiveness and a new start. This is a pattern throughout the whole Bible. Noah was on the ark for a long time. He was totally dependant on God and while he may have had doubts and fears he chose to trust in God. Sometimes we don’t “feel” Gods presence, even when we pray, read our Bible and worship Him. Our hope as Christians is not based on how we feel but in God Himself and His unfailing love only found through Jesus. We trust in His promises in His word. Sometimes we can all get caught up with our own agendas, thinking we know best and forget to walk with God. Noah did walk with God, but like us he also made mistakes. God however always remains faithful and provides a way out for His people. How can we ever question the love and purposes of God when we see that from the beginning of time Gods plan was to save us through the sacrifice of His own son? « What’s your fruit of happiness?